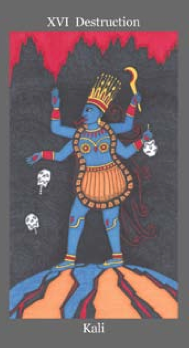 The Destruction card in the Dark Goddess Tarot by the divinely talented Ellen Lorenzi-Prince is, of course, Kali. Inspired by Ellen’s art and words, I created the following spread to provide a structure for navigating a time of difficult transition. 1. Ego. The lies your ego is telling you to keep you stuck in this situation. 2. Illusions. How you are allowing yourself to be fooled in this situation, and keeping yourself stuck. 3. Fear. What you truly fear that keeps you feeling powerless and keeps you stuck in the situation. 4. What you are ignoring at your peril. 5. What you must face to break free. 7. The energy shift that results from the blood sacrifice. 8. How to move forward with the new energy.